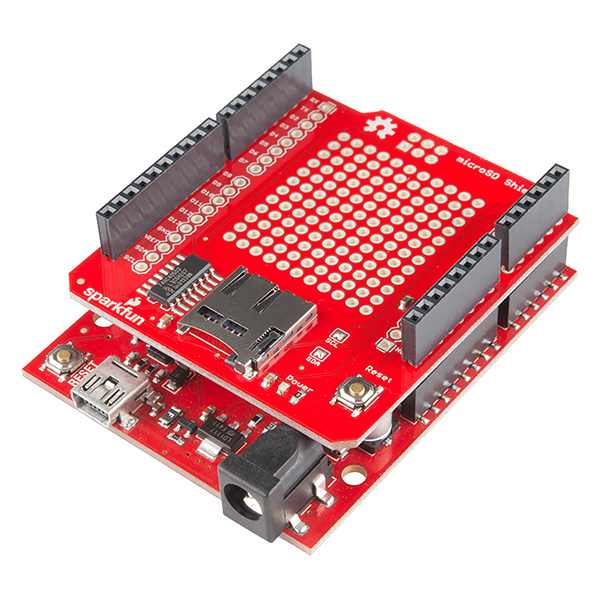 The SparkFun microSD Shield makes it easy to add mass storage to your project. 1x pack of R3 stackable headers for the shield. Before use, you will need to solder headers to your shield. Take a look at the Shield Assembly tutorial if you need a refresher. The microSD Shield uses the Uno R3 footprint with 1x 10-pin, 2x 8-pin, and 1x 6-pin headers. What is an Arduino? - New to Arduino? Start here. Installing the Arduino IDE - A refresher on using the Arduino environment. Arduino Shield Basics - Covers shields from a general standpoint. Serial Peripheral Interface (SPI) - This tutorial shows you how to communicate with an SD card over SPI. SD Cards and Writing Images - Learn the basics of SD and microSD cards. A large protoyping area where you can solder other parts for your project. A hex converter IC (which acts as a voltage level shifter between the Arduino's 5V logic and the microSD card's 3.3V-tolerant pins). The datatsheet for that IC can be found here. A power LED. Lights up as soon as the Arduino is powered. A reset button connected to the Arduino's reset line. SCL and SDA jumpers that tie the SDA and SCL pins (broken out on the R3 shield footprint) to the A4 and A5 pins to provide backward compatibility for older UNO models. These jumpers can be opened to free up pins A4 and A5 when using boards with a different I2C pin assignment like the Leonardo, Mega, and Due. Press your completed microSD Shield onto your Arduino, and connect the board to your computer with the Arduino's USB cable. The SparkFun microSD shield uses Pin 8 as the chip select line. To use the SD library with the shield, you'll need to change the line const int chipSelect = 4; to const int chipSelect = 8; in the CardInfo.ino sketch (the sketch below is already modified if you'd like to copy and paste it instead), then press Upload. Open your Arduino serial monitor by going to Tools > Serial Monitor to see the results of the card test. // functions will not work. If you have a smaller Arduino (or you'd like to put a full-size SD card in your project), you can use the SparkFun microSD Transflash Breakout or the SparkFun SD/MMC Card Breakout with the SD card library. Both examples use Pin 8 as the chip select line, just like the shield example above. 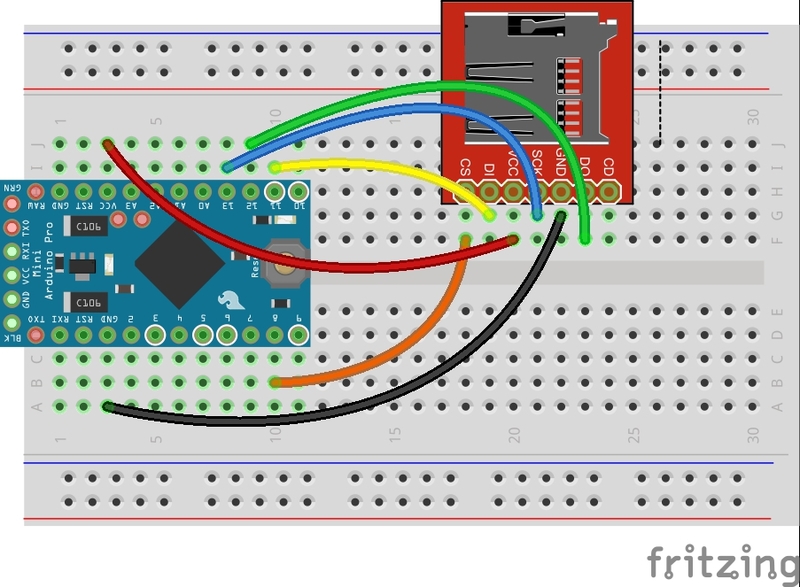 You can use either breakout with a 3.3V Arduino. Use a level shifter between the card breakout and your 5V Arduino. 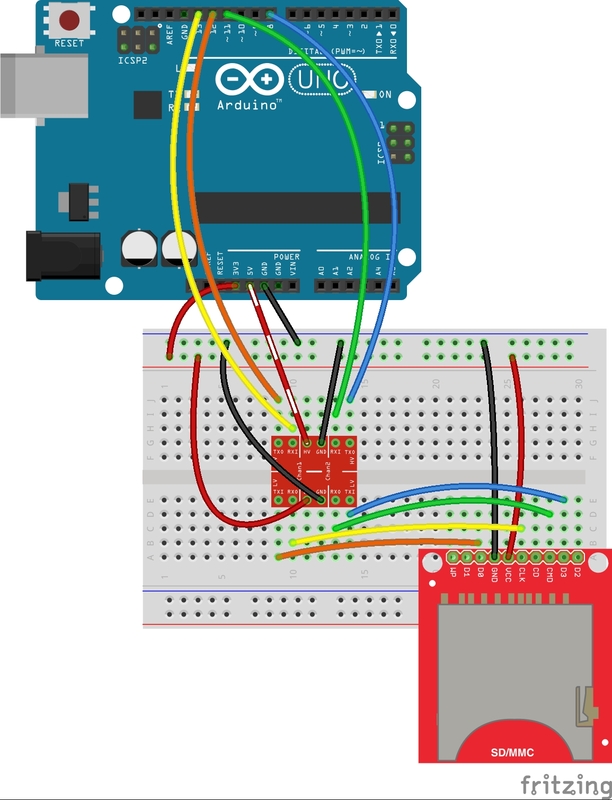 Arduino has troubleshooting tips on their Notes on the Arduino SD Card Library page, including instructions for formatting new cards (if needed) and using the library with other Arduino boards. Now that you know how to add more storage to your Arduino projects, it's time to get out there and create something amazing. Need some inspiration? 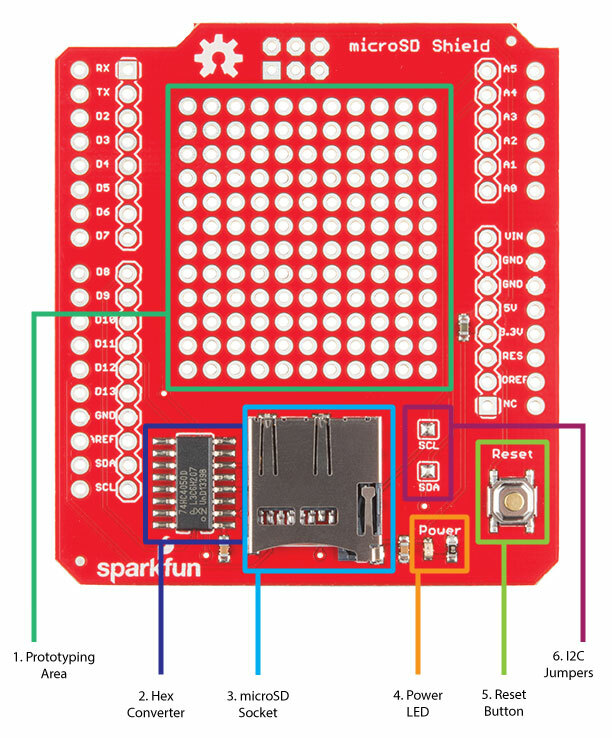 Check out these other SparkFun tutorials. SD cards are a great way to add more storage to Internet of Things projects. You can add a microSD Shield to a WiFly Shield to serve up larger web pages or hold more data. You can also use the CC3000 Shield, which has a microSD card slot built in. Need more power than your Arduino can provide? Check out the Edison, which also has a microSD card Block to add more storage to larger projects. Logging data is a common use for SD cards. Take your logging project to the next level with the Logomatic.